Sure it’s an old standby, but there is so much to love about this hike! First, it’s only 3.1 miles long but gains 1,400 feet of elevation. That means you’ll get a great workout without spending all day out there. The steep climb rewards you with excellent views of the entire front range. The loop’s relatively short length and the fact that the trailhead is less than a mile from downtown Boulder means you’ll be enjoying your first cold one before you know it! (Because let’s be honest, it’s really all about the post-hike). If those aren’t enough reasons to love this hike, there are also many alternate trails at Sanitas to keep things fresh and interesting. With its absolute bounty of outdoor adventures to be had, it was hard to pick just one awesome trail in Telluride. However, the Jud Weibe trail wins for best city hike because of its proximity to town, shorter length, and stunning views. 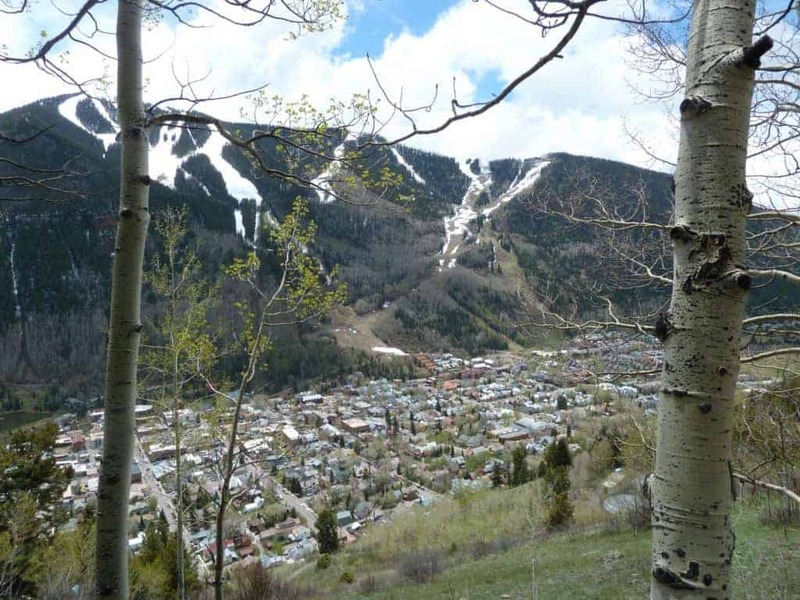 In just three miles, this loop trail gains 1,300 feet of elevation and provides the hiker with an outstanding panorama of the Telluride area, plus views of Bridal Veil Falls and gorgeous aspen groves. There is also an optional (and highly recommended) quarter-mile detour to the majestic Cornet Creek Falls. You’ll finish your hike only a few blocks from Telluride’s iconic downtown. Catching glimpses of Telluride from between the Aspens on the Jud Weibe Trail. Okay, I’m calling this one a “city bike” instead of city hike, due to the fact that there aren’t any real hiking trails accessible from downtown Denver. Denver’s lack of hiking trails doesn’t have to stop you from enjoying all of the perks that city hikes have to offer: zero time wasted in a car, an adventure filled with both wilderness and urban views, and plenty of options for your apres beer and snacks. There are two ways to bike from Denver to Golden, and they’re both great. I’d recommend taking the longer, mellower ride on the way there, and the shorter, more direct route to get home. For a lengthier, more scenic ride, take the South Platte River Trail from downtown to where it meets the Clear Creek Trail in Welby (about 7 miles). Then, ride the lovely Clear Creek trail straight into downtown Golden (about 20 more miles). I’d recommend stopping for lunch in Golden before turning around. On your way back, take 32nd Ave. You’ll pass directly beneath the Coors Brewery on your way out of town, then you’ll zip back to Denver in a mere twelve miles. When you return, don’t forget to treat yourself to something cold and boozy. You’ve earned it. This 3.6 mile out-and-back hike is another trail that packs a lot of punch in just a short distance. The trail climbs 585 feet and tops out with spectacular views every way you look. Gaze in one direction, and you’ll be able to take in the lovely and expansive Horsetooth Reservoir. Gaze in the other direction, and enjoy a wide panorama of the city of Fort Collins. For a longer hike, you can connect with the Reservoir Ridge Loop and the Foothills Trail. Since the trailhead is only 3 miles from the city center, you can do as the locals do and pedal your way over there. The bike ride to the trailhead has a whopping 9 feet of elevation gain, so you really have no excuses. Afterwards, head into town for a beer at one of Fort Collins’ many excellent breweries. Located just about three miles from downtown Colorado Springs, this lovely trail can be accessed by the Pikes Peak Greenway, a walking and biking path that runs north-south through the heart of the city. The Bear Creek Regional Trail is a nice and mellow 3.8 mile (one-way) out-and-back that gains 703 feet of elevation. The real beauty of this trail is its ability to be customized to your mood and ability. 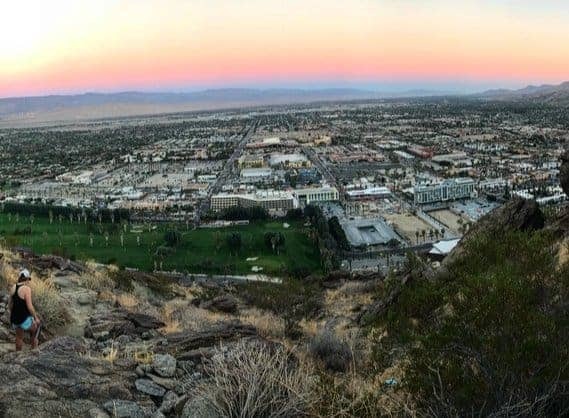 If you want an all-day hiking adventure, use the Bear Creek trail to connect to other, more challenging hikes like the Palmer Loop, Red Rock Canyon, or High Drive. With its less technical double-track, Bear Creek would also be great for a trail run or easy mountain biking outing. As with the rest of the city hikes mentioned above, the trailhead is just a short bike ride away from some excellent drinking and eating venues. Do you have a favorite city hike? Please share it in the comments below. Cheers!